Whole mount in situ hybridization (WISH) was used in an upper level undergraduate Comparative Vertebrate Biology course in addition to vertebrate dissections. This gave students the opportunity to study gene expression patterns as well as gross anatomy, linking the study of molecular and organismal biology within one course. Jacobs, N. L., Albertson, R. C., Wiles, J. R. Using Whole Mount in situ Hybridization to Link Molecular and Organismal Biology. J. Vis. Exp. (49), e2533, doi:10.3791/2533 (2011). Whole mount in situ hybridization (WISH) is a common technique in molecular biology laboratories used to study gene expression through the localization of specific mRNA transcripts within whole mount specimen. This technique (adapted from Albertson and Yelick, 2005) was used in an upper level undergraduate Comparative Vertebrate Biology laboratory classroom at Syracuse University. The first two thirds of the Comparative Vertebrate Biology lab course gave students the opportunity to study the embryology and gross anatomy of several organisms representing various chordate taxa primarily via traditional dissections and the use of models. 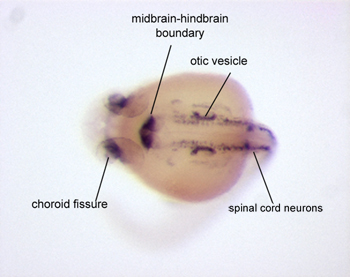 The final portion of the course involved an innovative approach to teaching anatomy through observation of vertebrate development employing molecular techniques in which WISH was performed on zebrafish embryos. A heterozygous fibroblast growth factor 8 a (fgf8a) mutant line, ace, was used. Due to Mendelian inheritance, ace intercrosses produced wild type, heterozygous, and homozygous ace/fgf8a mutants in a 1:2:1 ratio. RNA probes with known expression patterns in the midline and in developing anatomical structures such as the heart, somites, tailbud, myotome, and brain were used. WISH was performed using zebrafish at the 13 somite and prim-6 stages, with students performing the staining reaction in class. The study of zebrafish embryos at different stages of development gave students the ability to observe how these anatomical structures changed over ontogeny. In addition, some ace/fgf8a mutants displayed improper heart looping, and defects in somite and brain development. The students in this lab observed the normal development of various organ systems using both external anatomy as well as gene expression patterns. They also identified and described embryos displaying improper anatomical development and gene expression (i.e., putative mutants). For instructors at institutions that do not already own the necessary equipment or where funds for lab and curricular innovation are limited, the financial cost of the reagents and apparatus may be a factor to consider, as will the time and effort required on the part of the instructor regardless of the setting. Nevertheless, we contend that the use of WISH in this type of classroom laboratory setting can provide an important link between developmental genetics and anatomy. As technology advances and the ability to study organismal development at the molecular level becomes easier, cheaper, and increasingly popular, many evolutionary biologists, ecologists, and physiologists are turning to research strategies in the field of molecular biology. Using WISH in a Comparative Vertebrate Biology laboratory classroom is one example of how molecules and anatomy can converge within a single course. This gives upper level college students the opportunity to practice modern biological research techniques, leading to a more diversified education and the promotion of future interdisciplinary scientific research. Transfer stained embryos to an 80% glycerol solution in PBSt, using a graded series of washes, and store at 4°C. When performed correctly, the reaction between the NBT, BCIP, and alkaline phosphatase will form a purple precipitate that should appear on the zebrafish embryo as a purple stain. Riboprobes should be previously synthesized from cDNA corresponding to the gene of interest. Therefore, it can be concluded any stain visualized represents areas of the zebrafish in which the gene of interest has been transcribed at that particular developmental stage. For the purposes of this course, riboprobes were synthesized from aldh1a2 (previously raldh2; Begemann et al., 2001; Figure 1); fgf8a (Reifers et al., 1998; Figure 2); deltaC (Oates et al., 2005); myod1 (Weinberg et al., 1996); shha (Krauss et al., 1993), pax2a (Brand et al., 1996; Figure 3) and myl7 (previously cmlc2; Yelon et al., 1999) cDNA. Staining was expected in the midline and in anatomical structures including the somites, tailbud, myotome, brain, and heart. Ace/fgf8a mutants were expected to have defects in many of these structures. Staining was easily visualized using a standard dissecting microscope. Additional sources contain more information and troubleshooting on WISH techniques similar to those described here (Clark, 2003; D'Costa et al., 2009; Schmoldt et al., 2009; Schoenwolf, 2009). Figure 1. A zebrafish embryo 24 hours post fertilization, which has been hybridized with riboprobes specific for aldh1a2. 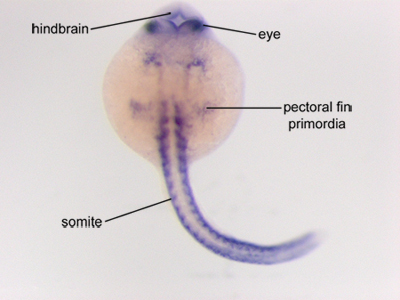 Specific staining can be seen in the eyes, hindbrain, pectoral fin bud primordia, and somites. Anterior is to the top, posterior is to the bottom. Figure 2. A zebrafish embryo at the 13 somite stage of development that has been hybridized with a probe specific for fgf8a. 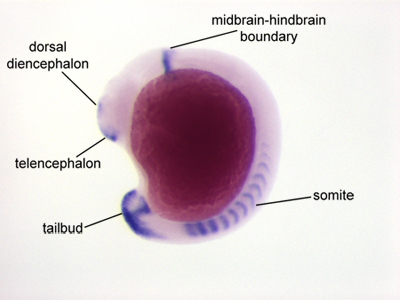 Specific staining is seen in the telencephalon, dorsal diencephalon, midbrain-hindbrain boundary, somites, and tailbud. Ventral is to the left, dorsal is to the right. Figure 3. A 22 hours post fertilization zebrafish embryo that has been hybridized with a riboprobe specific for pax2a, a robust marker useful for visualizing the nervous system. Specific staining can be seen in the choroid fissure, midbrain-hindbrain boundary, otic vesicle, and spinal cord neurons. Dorsal view with anterior to the left. WISH was used in a Comparative Vertebrate Biology laboratory course to help students understand the roles of genetics in anatomical development through the visualization of known gene expression patterns. For the first part of the course, students performed dissections on organisms representing several different chordate taxa, allowing them ample time to study, understand, compare, and contrast vertebrate anatomy. As an introduction to the second part of the course, students were given a formal lecture describing zebrafish development and anatomy. The methods and expected results of the WISH experiment were also discussed. Students were then given live zebrafish at somitogenesis and prim-6 stages of development, and at 2 and 5 days post fertilization (dpf) to examine under the dissecting microscope. This was to give students a better understanding of what zebrafish embryos look like and the types of morphological changes that occur over ontogeny. In the next laboratory session, students were given zebrafish embryos in which WISH had been previously performed. They were asked to study and describe the gene expression patterns for each gene of interest (riboprobe used). Embryos used for WISH were derived from matings between members of a heterozygous ace/fgf8a line. Based on Mendelian inheritance, 25% of the embryos from the ace/fgf8a matings were expected to be homozygous mutants and to exhibit defects in many of the anatomical structures focused on in this course. Based on published reports and unpublished observations in the Albertson lab, defects in the brain and improper heart looping were expected, as well as defects in the somites (Brand et al., 1996; Albertson and Yelick, 2005; personal observations). Students were asked to examine all specimens, wild type (heterozygous animals are indistinguishable from wild type siblings at early stages of development) and homozygous mutants, for each gene expression pattern presented. They were then asked to write lab reports describing their results, and based on their knowledge of anatomy and genetics, how defective gene expression may have precipitated anatomical malformations. Students seemed to receive this laboratory exercise with excitement and curiosity. Most had never used WISH before and were extremely interested in this part of the course. Students found the different patterns of gene expression in the zebrafish embryos intriguing, some even described the staining patterns visualized by associating them with well-known designs and symbols, such as a smiley face. The resulting lab reports showed the students had a general understanding of the WISH protocol and the expression of genes in specific anatomical structures. Students were also required to understand the specific functions of the genes studied using WISH during the lab (Stickney et al., 2000; Huelsken et al., 2002; Geetha-Loganathan et al., 2008a; Geetha-Loganathan et al., 2008b). It was evident however, that certain students had limited background knowledge of the signaling pathways and genes of interest. More information about these concepts in the WISH introductory lecture may be a welcome addition to the use of WISH in future Comparative Vertebrate Biology courses. Since the protocol generally takes four consecutive days, depending on the schedule of the course, students may only be able to complete a part of the experiment in class and the instructor must be responsible for the remainder. In our Comparative Vertebrate Biology class, students completed the staining reactions in the laboratory, while the Teaching Assistant performed all preceding steps. If it is preferred to have the students perform WISH in class, the protocol may be divided into subunits that can be performed over several laboratory sessions, depending on the time frame of the class. If it is not feasible for students to perform the entire protocol, as it was here due to the lab meeting only once a week, students can add the staining solution at the beginning of class and, depending on the riboprobe used, have the staining complete within an hour. The time it takes for the stain to develop varies greatly with each riboprobe and a variety of experimental conditions, and should be predetermined before class. Notably, if students will only be developing the stain in lab, instructors will be responsible for all preceding steps, which will require significant time and effort outside of the classroom. If desired, a shorter alternative to WISH could be immunohistochemistry, using antibody labels to visualize protein localization, however at this time, zebrafish-specific antibodies for developmental genes are not readily available. Another option would be to perform WISH on different vertebrate species and have the students compare the expression patterns of the same genes in different organisms (Pizard et al., 2004; Aramaki et al., 2007; Emerging Model Organisms, 2008; Emerging Model Organisms, 2010). The overarching goal of using WISH in a Comparative Vertebrate Biology course was to demonstrate to students how molecular biological techniques are used to study anatomical development. It also provided an opportunity for students to speculate as to how altered gene expression may lead not only to developmental malformations but also to evolutionary change. Formalized as evolutionary developmental biology (often referred to as "evo-devo"), this rapidly growing field of study aims to link genotype and phenotype through development, and to elucidate potential mechanistic bases of evolutionary change. With the rise of this field, more ecologists, organismal biologists, and physiologists are employing molecular techniques in their research. We contend that the use of WISH in a Comparative Vertebrate Biology course will help to keep the curriculum up to date with current technological and conceptual advances in research, and to facilitate a better horizontal alignment of upper level biology courses by combining biological subfields. Moreover, this integrative approach will provide students the opportunity to learn an assortment of biological research techniques in one course, leading to a more diversified education and the promotion of future interdisciplinary scientific research. The authors would like to acknowledge the Department of Biology at Syracuse University and Dr. Marilyn Kerr for their roles in the administration of the Comparative Vertebrate Biology course. The Albertson lab is supported by grant R21DE019223 from the National Institutes of Health/National Institute of Dental and Craniofacial Research, as well as grant R01AG031922 from the National Institutes of Health/National Institute on Aging. Albertson, R. C., Yelick, P. C. Roles for fgf8 signaling in left-right patterning of the visceral organs and craniofacial skeleton. Dev. Biol. 283, 310-321 (2005). Aramaki, M., Kimura, T., Udaka, T., Kosaki, R., Mitsuhashi, T., Okada, Y., Takahashi, T., Kosaki, K. Embryonic expression profile of chicken CHD7, the ortholog of the causative gene for CHARGE syndrome. Birth Defects Res A Clin Mol Teratol. 79, 50-57 (2007). Begemann, G., Schilling, T. F., Rauch, G. J., Geisler, R., Ingham, P. W. The zebrafish neckless mutation reveals a requirement for raldh2 in mesodermal signals that pattern the hindbrain. Development. 128, 3081-3094 (2001). Brand, M., Heisenberg, C. P., Jiang, Y. J., Beuchle, D., Lun, K., Furutani-Seiki, M., Granato, M., Haffter, P., Hammerschmidt, M., Kane, D. A., Kelsh, R. N., Mullins, M. C., Odenthal, J., van Eeden, F. J., Kane, D. A., Nüsslein-Volhard, C. Mutations in zebrafish genes affecting the formation of the boundary between midbrain and hindbrain. Development. 123, 179-190 (1996). Clark, M. In situ Hybridization: Laboratory Companion. Wiley-VCH. (2003). D'Costa, A., Shepherd, I. T. Zebrafish development and genetics: Introducing undergraduates to developmental biology and genetics in a large introductory laboratory class. Zebrafish. 6, 169-177 (2009). Emerging Model Organisms: A Laboratory Manual, Volume 1. Cold Spring Harbor Laboratory Press. Cold Spring Harbor, NY. (2008). Emerging Model Organisms: A Laboratory Manual, Volume 2. Cold Spring Harbor Laboratory Press. Cold Spring Harbor, NY. (2010). Geetha-Loganathan, P., Nimmagadda, S., Scaal, M. Wnt signaling in limb organogenesis. Organogenesis. 4, 109-115 Forthcoming. Geetha-Loganathan, P., Nimmagadda, S., Scaal, M., Huang, R., Christ, B. Wnt signaling in somite development. Ann Anat. 190, 208-222 Forthcoming. Huelsken, J., Behrens, J. The Wnt signaling pathway. J Cell Sci. 15, 3977-3978 (2002). Krauss, S., Concordet, J. P., Ingham, P. W. A functionally conserved homolog of the Drosophila segment polarity gene hh is expressed in tissues with polarizing activity in zebrafish embryos. Cell. 75, 1431-1444 (1993). Oates, A. C., Mueller, C., Ho, R. K. Cooperative function of deltaC and her7 in anterior segment formation. Dev. Biol. 280, 133-149 (2005). Pizard, A., Haramis, A., Carrasco, A. E., Franco, P., López, S., Paganelli, A. Whole-mount in situ hybridization and detection of RNAs in vertebrate embryos and isolated organs. Curr Protoc Mol Biol. Chapter 14, (2004). Reifers, F., Bohli, H., Walsh, E. C., Crossley, P. H., Stainier, D. Y., Brand, M. Fgf8 is mutated in zebrafish acerebellar (ace) mutants and is required for maintenance of midbrain-hindbrain boundary development and somitogenesis. Development. 125, 2381-2395 (1998). Schmoldt, A., Forecki, J., Hammond, D. R., Udvadia, A. J. Exploring differential gene expression in zebrafish to teach basic molecular biology skills. Zebrafish. 6, 187-199 (2009). Schoenwolf, G. C. Laboratory Studies of Vertebrate and Invertebrate Embryos: Guide and Atlas of Descriptive and Experimental Development. 9th Edition, Pearson Education- Benjamin Cummings. Upper Saddle River, NJ. (2008). Stickney, H. L., Barresi, M. J., Devoto, S. H. Somite development in zebrafish. Dev Dyn. 219, 287-303 (2000). Weinberg, E. S., Allende, M. L., Kelly, C. S., Abdelhamid, A., Murakami, T., Andermann, P., Doerre, O. G., Grunwald, D. J., Riggleman, B. Developmental regulation of zebrafish MyoD in wild-type, no tail and spadetail embryos. Development. 122, 271-280 (1996). Yelon, D., Horne, S. A., Stainier, D. Y. Restricted expression of cardiac myosin genes reveals regulated aspects of heart tube assembly in zebrafish. Dev. Biol. 214, 23-37 (1999). Thank you for your nice video. I have one question:How can I design the RNA probes to get high sensitivity and specificity results?Do the length and location of the DNA templates affect the labeling?